Beginning with a fiery speech by James Carvell about the importance of public education STARVING THE BEAST goes on to chart the troubling trend to see universities not as a place of higher learning and thus institution for the public good but rather consumer oriented organizations where users buy a service and it would all be run as a business. At the same time politicos are begining to see the colleges as place where an ideology more in keeping with their way of thinking could be taught. As a result higher education would be saved. Absolute must see film will completely horrify any rational person about the current state of higher education. This is isn't a film just about the way public institutions are going private but how and why this is a very bad thing. 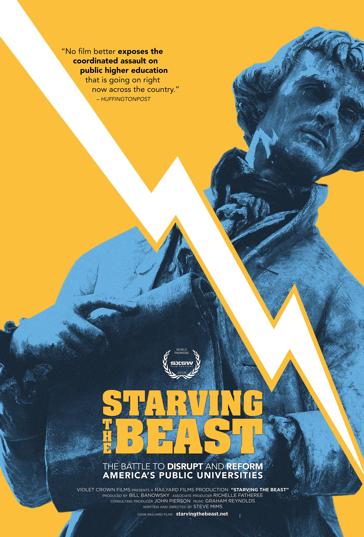 Its a film about how the conservative right, in places like Texas and Wisconsin is changing what students learn because of who is now footing the bill, Its a film about how that bill is going to hobble the students taking loans. And its also a film about the death of free speech because the change in faculty structure and hiring makes everyone afraid to speak out. I have no idea what to say or how to react to this film. Its a film so full of information I need to see it a couple more times before I truly comprehend what its saying. I know enough to be utterly horrified. This is one of the most important films of the year. Its a film that everyone who cares about the future of America should see because it is a dire warning of something terrible not far in the future. ....And that's a good thing because it makes it clear that the film really does know what it is talking about. Yes it can be tough to take it all in, but its so well done you'll want to see it a second or third time. This document, its much too important to label it as simply a film, is a must see. If you care about America and your children you have to see this film when it opens Friday.